Broccoli is a versatile vegetable most people eat year-round. A dark green cruciferous vegetable, broccoli offers an array of vitamins, minerals, and nutrients to a meal. Raw, uncooked broccoli contains many nutrients. In terms of macronutrients, 1 cup of raw, chopped broccoli is a light choice providing 31 calories, 6 grams of carbohydrate, 2.6 grams of protein, and 0.3 grams of fat. This cup of broccoli also provides 2.4 grams of fiber and 1.55 grams of natural sugar. Broccoli is also a powerhouse of vitamins and minerals. 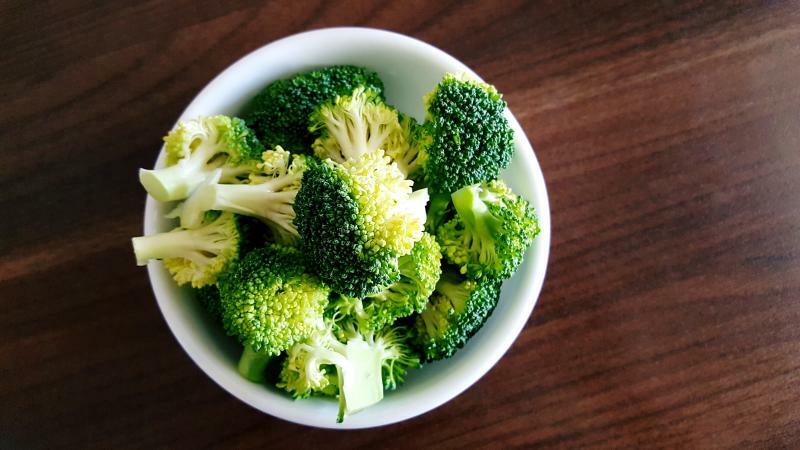 It is an excellent source of vitamin C and vitamin K; one cup of raw broccoli provides 90 percent of your daily vitamin C needs and almost 80 percent of your daily vitamin K1 needs. Broccoli is a good source of folate and also contains calcium, phosphorous, magnesium, potassium, thiamin, riboflavin, niacin, vitamin B-6, vitamin A, and vitamin E.
The nutrition content of broccoli changes once it is cooked. Different cooking methods present different changes. Frozen Broccoli - Freezing does not change the nutrient content. Frozen vegetables are flash frozen immediately after picking, making them even more nutrient dense than fresh vegetables sometimes. Fresh Broccoli - It retains all original nutrients if picked recently. Boiling and Steaming Broccoli - Cooking this way decreases the nutritional content, especially vitamin C and B. These vitamins are water soluble are lost in the water. Microwaving, Pressure-Cooking, Sauteing, and Roasting Broccoli - Cooking with one of these methods has a minimal effect on the nutrition content of broccoli. Altering between raw and cooked broccoli is the best way to ensure you receive all the nutrients broccoli has to offer. Broccoli is an excellent vegetable to incorporate into an everyday diet. This vegetable is full of vitamins and minerals and is low in calories. Mixing cooking methods when eating broccoli can help provide all the available nutrients found in broccoli.